The Department of Defense (DoD) annually awards individuals, service members, DoD civilians, teams, installations, military organizations, universities, businesses, employers for their outstanding achievements. These awards vary from honors and recognition to DoD funding and grants. 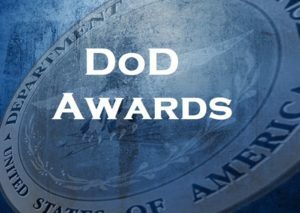 Find the DoD awards announcements below. DoD Contract Awards – United States Department of Defense Contracts valued at $7 million or more are announced each business day at 5 p.m.
DoD Grant Awards – This website contains publicly searchable descriptive abstracts of DoD grant awards starting from December 9, 2014, along with other grant award information. Search by the following fields: project title, award abstract, award number, DoD awarding office, recipient organization name, award amount, fiscal year, funding agency, start/end dates, creation/modified dates, and POC name. The Department of Defense announces today the 2019 Secretary of Defense Environmental Awards winners. Since 1962, the Secretary of Defense Environmental Awards have honored the outstanding efforts of service members and civilians across the Department of Defense to conserve the nation’s natural and cultural resources, protect human health, prevent or eliminate pollution at the source, clean up contaminated DOD sites, and incorporate environmental requirements into weapon system acquisition. The DOD components leverage technology to develop innovative solutions to existing and emerging human health and environmental challenges. “Strong environmental programs increase training access, improve mission readiness, and provide the capabilities required to prevail in conflict and preserve peace, all of which support DOD’s lines of effort to accomplish National Defense Strategy objectives,” said Ellen Lord, Under Secretary of Defense for Acquisition and Sustainment. A diverse panel of 58 judges from federal and state agencies, academia and the private sector evaluated nominations from the DOD components to help determine winners. Natural Resources Conservation, Large Installation: Eglin Air Force Base, Florida – relocated 1,030 gopher tortoises to avoid its listing under the Endangered Species Act and potential mission encumbrances. Eglin also conducted 160 prescribed burns across more than 145,000 acres on base, removing 290,000 tons of hazardous fuel biomass, and reducing wildfires caused by mission activities on test areas by 20%. Environmental Quality, Industrial Installation: Wisconsin Army National Guard – updated nine fueling systems as part of an effort to replace and update underground storage tanks at the end of their life cycle. This work helps intercept potential fuel spills and save tens of thousands of dollars in potential cleanup costs. Environmental Quality, Overseas Installation: Marine Corps Base Camp Smedley D. Butler, Okinawa, Japan – initiated a hazardous waste risk reduction audit, effectively reducing liability by ensuring accuracy and complete life cycle tracking of hazardous waste containers. Camp Butler also performed radon testing in 200 buildings, completed radon mitigation diagnostics in five buildings, and mitigated radon in 10 buildings. Sustainability, Non-Industrial Installation: Marine Corps Air Station Miramar, California – constructed an installation-wide microgrid that provides 100% renewable energy and offers energy distribution capable of supporting over 100 mission-critical facilities for three weeks if disconnected from the grid. Sustainability, Individual/Team: East Campus Reclaimed Water Team, National Security Agency, Fort Meade, Maryland – led an unprecedented military construction program that developed a financially and environmentally beneficial water-cooling supply system for high performing computers. This water-cooling system uses reclaimed water, reducing costs by 80 percent when compared to a conventional potable water-cooling method. Environmental Restoration, Installation: Naval Base Ventura County, California – used adaptive management techniques to achieve final cleanup of a methyl tertiary butyl ether groundwater plume 22 years ahead of schedule, resulting in $5.5 million in cost savings. Cultural Resources Management, Small Installation: Washington Army National Guard – implemented maintenance and treatment plans for historic sites to improve management and streamline State Historic Preservation Officer consultation time. Cultural Resources Management, Individual/Team: Ms. Rita McCarty, Mississippi Army National Guard – saved resources by establishing curation facilities on the installation. This allowed full public access to all holdings and eliminated the annual $5,000 university curation facility fee. Environmental Excellence in Weapon System Acquisition, Small Program: Tagnite Technical Working Group, U.S. Army Research Laboratory, Aberdeen Proving Ground, Maryland – developed and demonstrated a magnesium weapon system component manufacturing capability using both Tagnite anodizing immersion and brush application. This method reduces exposure to hexavalent chromium, a human carcinogen, and provides a more durable and corrosion resistant surface compared to traditional finishes. Switching to Tagnite anodizing is projected to save the Apache H-64 Helicopter program nearly $1.2 million per year through fiscal 2024. For more information on the 2019 winners, visit: www.denix.osd.mil/awards/2019secdef/. Additional information, including past winners, for the Secretary of Defense Environmental Awards Program is online at: www.denix.osd.mil/awards. WASINGTON, – The Defense Department announced the winners of the 2018 Nunn-Perry Awards today, recognizing excellence in the DOD Mentor Protégé Program. The nomination review process, completed during the second quarter of fiscal year 2019, evaluated 21 submissions. The competition was rigorous and the results incredibly close, with ten awardees who support three military departments and two defense agencies among them. The DOD Mentor Protégé Program was established Nov. 5, 1990, in response to concerns raised by DOD prime contractors regarding their inability to meet Small Disadvantaged Business subcontracting goals. At the time, many SDBs did not possess the technical capabilities to meet DOD subcontract requirements. Today, DOD Mentor Protégé Program participants deliver capabilities across major defense programs in support of the warfighter. Named for the contributions of Sen. Sam Nunn and the former Defense Secretary William Perry, who both played critical roles in the implementation of the DOD Mentor Protégé Program, recipients of the Nunn-Perry Award excel in technical assistance, protégé growth, and impact on protégé development. Shannon Jackson, acting director of the Small Business Programs within the Office of Industrial Policy, recently congratulated the winners and discussed the important collaborative roles that the mentors, protégés, and historically black colleges and universities (HBCU) play in the nation’s small business economy and the defense industrial base. “As our nation continues to face new and increasingly dynamic threats from across the globe, it must leverage the talents and capabilities of large and small businesses and HBCUs within the defense industrial base. These small businesses and universities not only include some of our nation’s brightest innovators but are major contributors to the American workforce and our economy,” Jackson said. Just as they have been key to the technological advancements that have fueled our past successes, today and in the future, we lean on them to lead in innovation and to help bring the latest in conventional and unconventional warfighting technology to the warfighter,” she added. The program looks forward to celebrating the accomplishments of the winners, listed below, at the upcoming Nunn-Perry Award Celebration in September. WASHINGTON, DC – The Department of Defense (DoD) recently announced the award of the Defense Science, Technology, Engineering, and Mathematics (STEM) Education Consortium (DSEC) cooperative agreement. The cooperative agreement was awarded to Research Triangle Institute (RTI), who will receive up to $15 million a year over the course of five years. The goal of the DSEC is to identify and support stronger programs for conducting Kindergarten – 12 and undergraduate STEM education and outreach efforts. It will provide the DoD with far-reaching sustainable and scalable programs through a consortium of organizations that have similar STEM goals. RTI will identify strategies to meet the vision and goals of the DoD STEM Strategic Plan, including: (1) building a highly-qualified STEM workforce in mission critical areas; (2) enhancing the preparation of dependents of our Armed Forces for careers in STEM; (3) providing education, outreach programs, and activities that stimulate an interest in STEM; and (4) promoting increased participation of underserved groups. DSEC members and their STEM education and outreach efforts will include programs such as For Inspiration and Recognition Science and Technology, National Math and Science Initiative, MATHCOUNTS, USA Science and Engineering Festival, and more. These programs will help the department continue to attract, inspire, and develop exceptional STEM talent across the education continuum and advance the current DoD STEM workforce to meet current and future defense technological challenges. The DSEC will allow the department to directly support improving permeability and recruitment through strategically investing in students of all ages in STEM education and outreach activities, giving them more exposure to DoD research and career opportunities. These partnerships will enable the DoD to encourage underserved, underrepresented, and military dependent students to pursue STEM careers and consider defense laboratories as a place of employment. Additionally, the DSEC will provide unique hands-on learning experiences where students can work side-by-side with the nation’s best scientists and engineers helping to create cutting-edge research and development. They will learn to transform new ideas into innovative solutions, helping the nation thrive by solving the complex problems of today’s world and its future. Arlington, Virginia – The Department of Defense (DoD) announced $169 million in its long-running multidisciplinary university research initiative (MURI) awards to 24 research teams pursuing basic research spanning multiple scientific disciplines. Since its inception in 1985, the tri-service MURI program has successfully convened teams of investigators to combine insights from multiple disciplines to both facilitate the growth of newly emerging technologies and address the Department’s unique problem sets. The highly competitive MURI complements the department’s single-investigator basic research grants and has made immense contributions to both defense and society at large. For example, a 1987 MURI team provided the first demonstration of self-assembled materials and micro-contact printing. These demonstrations provided a vital foundational framework in nanosciences that had transformative effects on fields including microfluidics, novel sensors, diagnostics and electronics. Additional notable MURI results include nanostructured materials to achieve new materials properties for phototronics applications, advances in computer vision systems and new pathways optoelectronics with micro-optics and micromechanical subsystems. For the fiscal 2019 competition, the Army Research Office, the Air Force Office of Scientific Research and the Office of Naval Research solicited proposals in 24 areas important to DOD and the military services. From a merit-based review of the 295 proposals received, a panel of experts narrowed the proposals to a subset from which the 24 final awards were selected. Awards of about $1.5 million per year for three to five years will be provided to these teams located across 73 U.S. academic institutions, subject to satisfactory research progress and the availability of funds. For a list of the winning teams, click here. The Department of Defense announced awards to 185 university researchers totaling $56 million under the Defense University Research Instrumentation Program (DURIP). These grants will be provided to 95 institutions across 36 states in fiscal 2019. The list of Minerva Award winners is available online. For more information on the Minerva Research Initiative, click here. A total of six field-level awards are presented in three categories – large, medium, and small. The recipients of this year’s Secretary of Defense Field-level Maintenance Awards in the large category are the 1st Maintenance Battalion, Combat Logistics Regiment 15, 1st Marine Logistics Group, I Marine Expeditionary Force and the 48th Maintenance Group. Winners in the medium category are the Headquarters and Headquarter Company, 4th Battalion, 160th Special Operations Aviation Regiment (Airborne) and Fleet Readiness Center Mid-Atlantic Oceana. The small category winners are Helicopter Sea Combat Squadron TWELVE and 31st Munitions Squadron. WASHINGTON, DC – The Department of Defense (DoD) announced today the award of four grants in support of the Manufacturing Engineering Education Program (MEEP). The grants were awarded to Battelle Education, Clemson University, the Massachusetts Institute of Technology, and the National Center for Defense Manufacturing and Machining. These organizations and universities will receive a total of $5,775,755 over a three-year period to enhance or establish educational programs that support manufacturing engineering education. Battelle will leverage public private partnerships to strengthen the manufacturing engineering education at the high school level. Clemson University (Clemson, SC): Clemson University will develop immersive and personalized instruction to strengthen learning and retention for high-school through graduate school students. Massachusetts Institute of Technology (Cambridge, MA): The Massachusetts Institute of Technology will develop a comprehensive 15-month apprenticeship training program in support of a highly-skilled manufacturing workforce. This program will teach general and specific manufacturing competencies (ex., introductory quantum mechanics, electrical technology, and design principles) that demonstrate the interrelation of various manufacturing sectors. National Center for Defense Manufacturing & Machining (Blairsville, PA): The National Center for Defense Manufacturing & Machining will develop and launch a series of new virtual courses, inclusive of additive manufacturing and related technologies, to broaden and extend the scope of the Society of Manufacturing Engineers’ long-standing certificate programs. WASHINGTON — Twenty-five personnel received Department of Defense Disability Achievement and Recognition Awards at a Pentagon ceremony, Oct. 4. The Department of Defense (DoD) announced selection of an academic team comprised of researchers from the U.S. and United Kingdom for the Bilateral Academic Research Initiative (BARI). The awarded team is led by Dr. Maryam Shanechi at the University of Southern California for the U.S. and Dr. Riccardo Poli at the University of Essex for the U.K. The U.S. research team will receive up to $3,00,000 million of U.S. DoD funding over three years, and the U.K. research team will receive up to £1,500,000 million from the U.K. Ministry of Defence (MOD) core research portfolio over the same time period. BARI, a pilot program, supports high-risk basic research as a bilateral academic collaboration. BARI’s inaugural year focuses on artificial intelligence and collaborative decision-making. Specifically, BARI sought proposals that build new frameworks for artificial intelligence agents to more truly team with human counterparts. BARI also aims to support academic teams from the U.S. and U.K. to combine unique skillsets and approaches and provide rapid advances in scientific areas of mutual potential interest to both countries. For more information on the Basic Research Office, please visit: http://basicresearch.defense.gov/. Arlington, VA – The Department of Defense (DoD) announced awards to 45 minority-serving institutions totaling $25.8 million as part of the fiscal year (FY) 2018 DoD Historically Black Colleges and Universities and Minority-Serving Institutions (HBCUs/MSIs) Research and Education Program. The selected institutions will conduct basic research with student support in scientific disciplines critical to national security and the DoD. Awards ranging from $300,000 to $600,000 will support three-year research projects with up to four students per project each year. The announcement is the result of a merit competition administered by the Army Research Office under policy and guidance of the Office of the Under Secretary of Defense for Research and Engineering (OUSD(R&E)) with participation from the Office of Naval Research, and the Air Force Office of Scientific Research. All awards will be made by the Army Research Office. The goals of the DoD HBCU/MSI program are to enhance research programs and capabilities in scientific and engineering disciplines critical to the national security functions of DoD; enhance the capacity of HBCU/MSI to participate in DoD research programs and activities; and increase the number of graduates, including underrepresented minorities, in fields of science, technology, engineering, and mathematics (STEM) important to the defense mission. The FY 2018 Funding Opportunity Announcement received 139 eligible proposals with combined requested funding totaling $80 million. Applications were evaluated by the three Service research offices, and the most meritorious were selected for awards. Award recipients represent 27 HBCUs and 18 MSIs and support the research interests of OUSD(R&E) and all three Services. All awards are subject to the successful completion of negotiations between DoD and the academic institutions. Click here for the list of awardees. The Department of Defense announced the selection of five university-industry teams for the Defense Enterprise Science Initiative (DESI). DESI is a pilot program supporting university-industry research collaboration focused on accelerating the impact of basic research on defense capabilities. DESI’s goals are twofold. First, it seeks to foster sustainable university-industry partnerships to identify and apply new discoveries and knowledge on existing capabilities and address technological gaps. DESI also aims to charter a new pathway to accelerate the transfer of basic research to innovative technologies and complement the Department’s other basic research programs such as the Vannevar Bush Faculty Fellowship, the Multidisciplinary University Research Initiative (MURI), and the Defense University Research Instrumentation Program (DURIP). DESI is sponsored by the Basic Research Office in the Office of the Under Secretary of Defense for Research and Engineering. The Air Force Office of Scientific Research administers the program in collaboration with the Army Research Office. For more information on the Basic Research Office, please visit: basicresearch.defense.gov. In a ceremony in the Pentagon auditorium at 2:30 p.m. on June 28, the Department of Defense will present the Fiscal Year 2017 Value Engineering (VE) Awards. As part of the broader DoD Honorary VE Awards Program, the award recognizes DOD civilian and military organizations, teams, individuals, and programs or projects demonstrating exemplary VE accomplishments. Acting Deputy Assistant Secretary of Defense for Systems Engineering Kristen J. Baldwin will honor the award recipients. Value engineering was born out of innovative material and design alternatives resulting from the material shortages of World War II. DoD Components use VE to analyze programs, projects, systems, products, equipment, facilities, buildings, services, and supplies to achieve essential functions at the lowest life cycle cost consistent with required performance, reliability, quality, and safety. To view the DoD VE Achievement Awards Ceremony live or archived, visit https://www.dvidshub.net/webcast/16037. For a list of FY 2017 VE Achievement Award recipients and descriptions of their accomplishments, and past recipients visit the DoD Systems Engineering website: https://www.acq.osd.mil/se/initiatives/init_ve.html. WASHINGTON – The Department of Defense announced the 15 recipients of the 2018 Secretary of Defense Employer Support Freedom Award, the highest U.S. government honor to employers for support of National Guard and Reserve employees. Hiawatha, Iowa Crystal Group, Inc.
Newmarket, New Hampshire ArgenTech Solutions, Inc.
Omaha, Nebraska Werner Enterprises, Inc. The 2018 recipients were selected from more than 2,350 nominations received from Guardsmen and Reservists highlighting how their civilian employers went far beyond what the federal law requires to support them. The Freedom Award began in 1996 under the auspices of Employer Support of the Guard and Reserve to recognize exceptional employer support, with 250 honorees to date. For more information about the Freedom Award and this year’s recipients, visit www.FreedomAward.mil. To learn more about ESGR, part of the Defense Personnel and Family Support Center, visit www.ESGR.mil. ALEXANDRIA, VA — May 18, 2018 — Vicenza Middle School science teacher Anna Sansone has been selected as the 2019 Department of Defense Education Activity (DoDEA) Teacher of the Year. DoDEA Director, Mr. Thomas M. Brady spoke to her teaching style and educational philosophy. “Ms. Sansone brings a persistent and relentless belief in student achievement and success, and she pursues engaging learning activities that bring the community into the classroom and the classroom to the community,” said Brady. Ms. Sansone is a 7th grade science teacher at Vicenza Middle School in Vicenza, Italy. Ms. Sansone has twelve years teaching experience, eight of which have been with DoDEA. Prior to her present work in Vicenza, she also taught science and social studies and served as an Educational Technologist at EJ King High School in Sasebo, Japan and taught math and science at the Incirlik Unit School in Incirlik, Turkey. An undergraduate Environmental Science and Policy major at Clark University, Ms. Sansone has a Master of Arts from National Louis University in Secondary Science Teaching, and Master of Science in Instructional Design and Technology from Walden University. She is currently working toward a PhD. Certified in science, math, social studies, Spanish, and as an Educational Technologist, she focuses on developing STEM literacy in diverse learning contexts. Her goal is to help students develop an identity as scientists and historians in her classroom through collaborative learning, real-world applications, and inquiry-based instruction. The DoDEA Teacher of the Year Program recognizes and honors exemplary Pre-K through high school teachers. The process begins at the nomination level where teachers may be nominated by peers, administrators, parents, students or community members. Each District Teacher of the Year is selected by a district panel using specified criteria to review District teacher of the Year applications. Eight teachers were named District Teacher of the Year for 2019. Each District Teacher of the Year is invited to apply for the DoDEA Teacher of the Year. Along with public recognition and the award, Ms. Sansone will gain entry into the National Teacher of the Year application pool and will be recognized by the President at a future event at The White House. Ms. Sansone will also attend the National Teacher of the Year Conference and participate in the Council of Chief of State School Officers (CCSSO)-sponsored Teacher of the Year events. The year of service for the 2019 Teacher of the Year will begin on January 1, 2019 and run through December 2019. The selection is made months before the term begins to allow the DoDEA candidate and other candidates from the 50 states time to participate in the National Teacher of the Year program which selects a finalist in December. The current (2018) DoDEA Teacher of the Year’s term runs through the end of December 2018. A complete listing of this year’s recipients is listed on the next page. Additional information about DoDEA’s Teacher of the Year Program, including point of contact, may be found on our web site. Installations compete on how well they achieve departmental objectives in several areas of installation management, including mission support, energy conservation, quality of life and unit morale, environmental stewardship, real property management, safety, health and security, communications, and public relations. Excellent installations enable better mission performance and enhance the working and living conditions for military men and women, DOD civilians and their families. Each of the winning installations succeeded at being the best in achieving excellence in performing installation management within their Military Service and the Defense Logistics Agency. Each winning installation will receive a commemorative Commander in Chief’s Award trophy and flag and a congratulatory letter from the President. For information about each winning installation’s accomplishments, visit http://www.acq.osd.mil/eie/. The Department of Defense (DOD) announces the 2018 Secretary of Defense Environmental Awards winners. The awards recognize individuals, teams and installations for their exceptional environmental achievements and innovative, cost-effective environmental practices. “By safeguarding the long-term sustainability of our nation’s vital resources, DOD is improving the capabilities of our forces,” said Ellen Lord, Under Secretary of Defense for Acquisition and Sustainment. For more than half a century, the Secretary of Defense Environmental Awards have annually recognized the extraordinary efforts of service members and civilians across the Department of Defense to protect the environment, human health and the nation’s natural and cultural resources. Environmental stewardship enables the Department to enhance military readiness capabilities, strengthen alliances and increase efficiencies for greater performance and affordability. A diverse panel of 63 judges from federal and state agencies, academia and the private sector evaluated nominations from the DOD components to help determine the winners. Natural Resources Conservation, Small Installation: Hawaii Army National Guard –implemented a multifaceted invasive species management program to increase acreage available for training and conserve a unique tropical ecosystem. Natural Resources Conservation, Individual/Team: Natural Resources Conservation Team, Naval Base Ventura County, Calif. – established programs to support coastal resilience, conserve habitat and species, and reduce costs at its three primary operating facilities. Environmental Quality, Non-Industrial Installation: Fort Hood, Texas – exceeded Qualified Recycling Program goals by selling 27.2 million pounds of recyclable materials and surpassed water and energy reduction goals by installing a solar photovoltaic array, wind turbines, and water conservation systems. Environmental Quality, Individual/Team: Frederick A. Javier, 1st Special Operations Civil Engineer Squadron, Hurlburt Field, Floa. – provided outstanding leadership by training installation staff on environmental management and engaging with the local community to promote the DOD’s mission and science education. Sustainability, Industrial Installation: Marine Corps Logistics Base Barstow, Calif. – achieved reductions in electricity and water consumption while partnering with local government to gain cost savings. Environmental Restoration, Installation: Vandenberg Air Force Base, Calif. – completed a 10-year performance-based restoration initiative resulting in response complete or site closure for 44 environmental restoration sites ahead of schedule, and maintained accelerated or on-time closure for 55 additional sites. Environmental Restoration, Individual/Team: Vieques Environmental Restoration Team, Puerto Rico – implemented successful restoration projects to remove unexploded ordinances and cleanup contaminants while engaging with local partners. Cultural Resources Management, Large Installation: Camp Ripley, Minnesota Army National Guard – completed an installation-wide record of all archaeological sites that will benefit cultural resources management and reduce impact to critical military operations. Environmental Excellence in Weapon System Acquisition, Large Program: Combat Rescue Helicopter Program Environment, Safety and Occupational Health Team, Wright Patterson Air Force Base, Ohio – implemented programs to eliminate or reduce exposure to hazardous materials like hexavalent chromium (Cr6+). The Department of Defense announced awards to 175 university researchers at 91 institutions in 36 states, totaling $53 million through the Defense University Research Instrumentation Program. DURIP augments research capabilities at universities conducting cutting edge research for DoD, through the procurement of state-of-the-art equipment. Awards are administered through a merit competition jointly conducted by the Army Research Office, Office of Naval Research, and Air Force Office of Scientific Research. Solicited proposals target university investigators conducting foundational science and engineering research of importance to national defense. Pertinent research underpins advances in materials, structures, and manufacturing science; quantum and nanosciences; computing and networks; electronics, electromagnetics, and electro optics; acoustics; neuroscience; fluid dynamics; robotics and artificial intelligence; and ocean, environmental, and life sciences and engineering. The annual DURIP awards process is highly competitive. Collectively, the Service research offices received 671 proposals, requesting $254 million in funding, of which the most meritorious proposals were selected. Selections made by the Service research offices are subject to successful completion of negotiations with the academic institutions. The list of winning proposers can be download here. WASHINGTON – Employer Support of the Guard and Reserve proudly announces the 30 finalists for the 2018 Secretary of Defense Employer Support Freedom Award. The finalists represent large and small employers, as well as government organizations. ESGR received nominations for employers in all 50 states, Guam-CNMI, Puerto Rico, the U.S. Virgin Islands and the District of Columbia. The ESGR National Selection Board will select and announce the 15 recipients of the 2018 Secretary of Defense Freedom Award by mid-June. The complete list is also at www.freedomaward.mil and www.esgr.mil. – The Freedom Award began in 1996 by Employer Support of the Guard and Reserve to draw attention to support from the employer community. – To date, only 250 employers have received the award. Acquisition Awards – The Defense Acquisition Workforce Individual Achievement and Development Innovation Awards recognizes Department of Defense (DoD) civilian and military teams who have, in their approach to program management, demonstrated innovation and technical excellence in the acquisition of products and services to achieve more cost effective acquisition outcomes for the Warfighter and the taxpayer. BARI Awards – The BARI (Bilateral Academic Research Initiative) awards supports basic research in science and engineering stemming from collaborative research between institutions of higher education in both the US and United Kingdom (UK) that is of potential interest to the US DoD and UK Ministry of Defense. Commander in Chief’s Annual Award for Installation Excellence – The Commander in Chief’s Annual Award for Installation Excellence recognizes the outstanding and innovative efforts of the people who operate and maintain U.S. military installations. Defense Maintenance Awards – Recognizes outstanding achievements in weapon systems and military equipment maintenance. There are individual and team awards. The Depot Maintenance Excellence Award Field-Level Maintenance Awards. Department of Defense Education Activity (DoDEA) Teacher of the Year – The DoDEA Teacher of the Year (TOY) Program brings recognition to great teachers, students, parents, districts, communities, DoDEA and the profession of teaching. DESI Awards (Defense Enterprise Science Initiative) – DESI is a pilot program supporting university-industry research collaboration focused on accelerating the impact of basic research on defense capabilities. DUIRP Awards (Defense University Research Instrumentation Program) – DURIP instrumentation awards provide the unique means through which DoD supports universities in the acquisition of essential laboratory equipment, usually out of reach for most research grants. Freedom Awards – The Employer Support Freedom Awards are the highest recognition given by the U.S. Government to employers for their support of their employees who serve in the National Guard and Reserve. National Public Lands Day Department of Defense Awards – Funds are available for base-level projects on any DoD site that supports the goals of National Public Lands Day: to improve the quality of public lands and to educate the public about natural resource issues and stewardship. NPLD projects that take place on DoD lands that are open to the public for recreation, including those managed by the US Army, Air Force, Marine Corps, National Guard, or Navy. Research and Education Awards to Minority-Serving Institutions – Awards ranging from $300,000 to $600,000 will support three-year research projects with up to four students per project each year. Secretary of Defense Environmental Awards – The awards recognize individuals, teams and installations for their exceptional environmental achievements and innovative, cost-effective environmental practices. Support Freedom Awards – The highest U.S. government honor to employers for support of National Guard and Reserve employees. Value Engineering (VE) Awards – The award recognizes DOD civilian and military organizations, teams, individuals, and programs or projects demonstrating exemplary VE accomplishments.